The diversity ranges from tiny lizards to elephants. 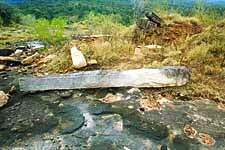 But unlike other such reserves, Nilgala has to be approached on foot. As wondrous as the sudden sighting of an elephant is as one weaves ones path around the Aralu, Bulu Nelli and through the tall mana grass, a certain degree of caution has to be exercised for the dangers are many. The Galoya National Park is situated on the border of the Eastern Province. It was way back in 1954 that this large tract of jungle covering a total of 25,900 hectares was declared a national park. In fact it constitutes the upper watersheds of the Senanayake Samudra, the key irrigation facility of the Galoya Project. It has also become a refuge for all the wildlife displaced by the settlement scheme. At one end of the park is Nilgala. The rolling savannah is surrounded by a ring of hills, the more famous among them being Danigala. Yakunge Hela, Nilgala, Bulu Hela, Endagala, Kahatatta Hela, Guru Hela and Akuna Hela are the other peaks in this range. The diversity ranges from tiny lizards to elephants. 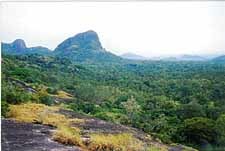 But unlike other such reserves, Nilgala has to be approached on foot. As wondrous as the sudden sighting of an elephant is as one weaves ones path around the Aralu, Bulu Nelli and through the tall mana grass, a certain degree of caution has to be exercised for the dangers are many. Any excursion, then, has adventure written into the unfolding script. It was in the jungle around Nilgala that I made my tracks a few weeks ago. It happened like this. Within the protected area there lies a large tract of paddy land. Legend has it that the ancestors of the present day farming families had arrived in the area fleeing from the marauding British troops that ran riot to quell the Wellasssa Rebellion. Needless to say, these lands have always been threatened by elephant attacks, especially in the context of dwindling feeding grounds for the threatened creature. I went to Nilgala with one Lalith Seneviratne, formerly of the Motorolla Company, who was helping set up an early warning system for the benefit of the people. It was a simple device, a string which, if an elephant touched it, would set off an alarm that would warn the farmers. The road to Nilgala lies across a wide plain of tall grass. On the right rises Kahatatta Hela, which is the most significant peak in the area. This is due to the archeaological remains found here. It was H.A. 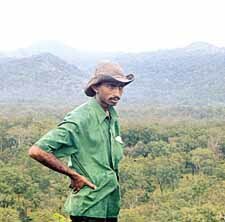 Piyadasa, one of the Assistant Rangers, who told me about this. I was immediately possessed by a desire to climb this peak. "But be careful....there are elephants," he sounded a warning. The hot midday sun and a sudden shower in the early afternoon delayed our journey. My "guide" was a fascinating young man by the name of Amila. Born and bred in that jungle, Amila had an above average command of English and I learnt that he is continuing to study the language. At a certain point along the road, Amila told me that we had to turn into a forest path to climb Kahatatta Hela. "We will have to be quick; this is the time the elephants come out," Amila said. The paths are relatively clear, since regular travel by the herds have flattened the grass. Still, have to sweat in order to keep pace with Amila. Finally we come to the foot of the mountain. "From here onwards its just the rock," I was informed. "Since it is late, we cant take the regular route. Lets try to climb from here," Amila speaks with the authority that can come only from someone who knew the place intimately. The man is already on his way. I let my gaze absorb the surroundings. All around me there are signs of elephants. There were places obviously trampled down by the pachyderms. There were also heaps of elephant dung. I start clicking my camera. "Hurry up!" my friend Amila is impatient. I obey immediately. Before long, we are on top of the rock. Beneath us is the forest reserve, stretching away right up to the ring of mountains. Among these peaks is Danigala, noted for the veddahs who have lived there for who nows how long. Scattered all around were the remains of ancient structures. Legend has it that this was also one of the many places where King Dutugemunu had camped and gathered his forces as he marched on King Elara. It is also said that King Valagamba had taken refuge here. There are countless stories about the ruins and about the rebellion in the early nineteenth century. They speak of other narratives that need to be related at some point. I shall reserve that exercise for later. And again, there were signs that the herd has on occasion spent time here. Amila points to the West, "it is easier to climb down from that side". The stench of elephants literally curls the nostrils. It is now around 5 pm. Unable to bear it any longer, I confess my fears, "Amila, I am sure there are elephants down there". He laughs away my concerns, insisting that the herd was quite a long way off. The next moment we hear a brach being snapped. "There!" Amila points. Far away, an elephant comes into view. It is a female, Amila informs me. Soon a calf joins her. Amila suggests that we go near. The mother and the baby elephant are at the foot of the adjoining mountain. Amila has already taken off before I could reply. I bid goodbye to the silent sentinels watching over the jungle and all its residents from the far horizon and follow him. I am wary of approaching the elephants. Although we can see just one adult elephant, I wonder if the rest of the herd is nearby. The shower has rendered our path slippery. If there are any elephants around, I am sure that I wouldnt hear anything. The entire environment seems to rebel against my presence. I have many things to worry about. It is past 5.30 now. This is the hour of the elephants. And yet, Amila marches on, without a care, it seems. The distance between the elephants and us is now less than 40 feet. There is a rock behind which we can hide. But then again, they were down-wind from us. From the rock by which we were standing, the elephants are less than twenty feet away. I knew that we had next to nothing by way of protection. We peeped over the rock. 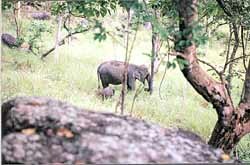 The mother and baby were feeding, ambling along in the carefree manner so characteristic of elephants. Darkness is fast invading the area. I continue to click away on the camera. In a few minutes another females joins them. We watch, fascinated. The baby elephant thrusts its trunk into the mother's mouth. Playful and enchanting in the hundred and one games it plays. We watch in silence without moving an inch. "Let's go," I tell Amila. It is after 6 pm now. It would take at least another hour or so for us to get back. We could encounter other elephants along the way. I have only my tiny flash light. But Amila is still enjoying the frolics of the baby elephant. The baby elephant has no way of knowing what dangers the future has in store. Blissfully unaware of all the many threats he would have to face in the coming years, he rolled in the grass playfully. How much like a child, I think to myself. Happy in not knowing. Innocent. It is time to turn back. We take our leave with these and other thoughts and a thousand images which not even the most sophisticated camera can capture, promising ourselves other such journeys and dreaming of things to discover and secrets to unravel.